Green tea is rich in vitamin C, especially sencha (green tea grown in full sun) contains 2.6 times more vitamin C than a lemon does, so it brightens skin and prevents sun-related skin damage. It is also said vitamin E, beta-carotene, and polyphenol in green tea have antioxidant and anti-aging effect. Maybe you can find green tea used skin care products in your country, but did you know that you can easily make homemade green tea facial pack? Put used tea leaves in a tea bag, or soak a sheet of cotton or tissue in green tea, and patch it on skin for a couple of minutes. 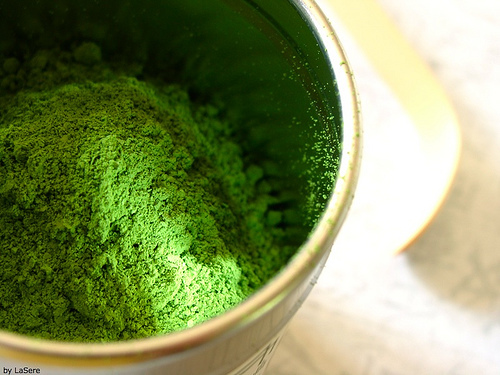 Mix green tea powder and flour in the ratio of one to two, and add water until it becomes as soft as an earlobe. Spread it on your face and wait 5 to20 minutes, and rinse with warm water before it gets dry. Egg adds moisturizing effect while yogurt makes skin smooth. Spread the mixture on your face and wait 5 to20 minutes, and rinse with warm water before it gets dry. Green tea is a miracle tea with multi effects. I hope you notice a difference in your skin after using the packs.